In 2018, the people of Indonesia suffered the devastating effects of a series of disasters. 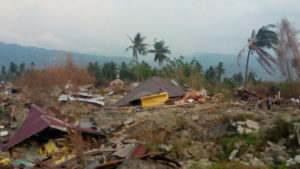 On September 29th, an earthquake and tsunami killed almost 2,300 people in the regions of Palu, Sigi, and Donggala. With over 220,000 displaced, over 1,300 are still missing. On December 22nd, a deadly tsumani swept along Sunda Strait, injuring over 14,000. 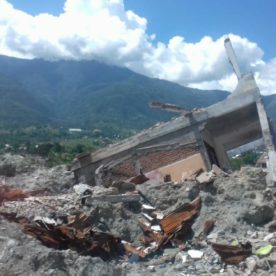 MSCs in Indonesia are working to rebuild lives in the wake of these catastrophies. The lack of a clean water supply is an urgent issue. MSCs in affected regions are raising funds to drill water wells in three points, including water storage tanks and public toilet facilities for use by local communities. Each water well will cost approximately €18,200, and will provide vital clean water and essential hygiene facilities for the affected areas. 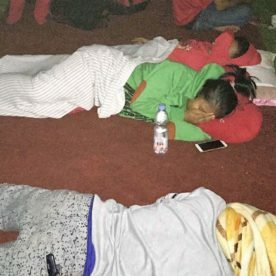 Thousands of houses have been destroyed beyond repair, and many survivors are currently living in temporary accommodation. The Indonesian Province of the MSC propose to build seven houses in affected regions. Each house will cost approximately €3,050 to build and will offer renewed hope to a displaced family. 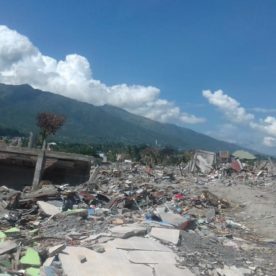 MSC missionaries in Indonesia are working to help survivors of the recent natural disasters. Education has been severely impacted by the disasters, as children have been orphaned or have been forced to leave school in order to work and help to support their families. Together with the Daughters of Our Lady of the Sacred Heart, the Indonesian Province of the MSC will provide scholarships for vulnerable children to allow them to continue their education. The MSC will have the responsibility of funding 100 students for three years. €15 will cover the cost of one month’s education for a scholarship student. Many families affected by these disasters have lost everything, even the most basic necessities. The Indonesian Province of the MSC will help 100 affected families by providing essential kitchen tools for cooking and eating. €50 will provide kitchen essentials including cooking and eating utensils for one family.